The Governor’s Tax Plan (HSB 671) and the Senate-passed plan (SF2383) both would expand the current deduction for contributions to a college savings account — a 529 plan — by allowing the funds in those accounts to be used for private K-12 school tuition. It does this by conforming to the new federal definition of allowable withdrawals. Conformity to the IRC here is something of a misnomer. A taxpayer who makes a contribution to a 529 plan receives a federal benefit: The interest or other earnings on the contribution are not taxed when the money is withdrawn to pay college education expenses. The tax advantage exists only to the extent that there is genuine savings involved over a period of time, with interest earnings or capital appreciation that would otherwise be taxed. Iowa law currently goes beyond the federal law by allowing the taxpayer to deduct the contribution to the plan, up to a dollar limit of $3,239 per child per contributor, for the year when the contribution is made. [i] It thus provides an immediate tax benefit, which can be taken whether or not the funds are left in the account to earn interest. By conforming to the federal definition of what is an allowable use of 529 plans, Iowa would be extending this state deduction benefit to parents of children in private K-12 schools. Many low-income families will receive no benefit because even without the 529 deduction they have little or no taxable income. This will be even more common if a tax bill is passed that raises the Iowa standard deduction, because that would put many more families, primarily those with lower than average income, in the zero taxable income category where a further deduction is of no value. Even for low-income families with taxable income the deduction will be worth very little and will not make private school tuition appreciably more affordable. Consider a family with $40,000 total income, taxable income of $30,000. The additional deduction for private school tuition would reduce their state income tax by just $210. Even a family with $80,000 total income and $60,000 in taxable income would save just $257 by taking the maximum deduction for one child of $3,239. Fiscal impact estimates by the Iowa Department of Revenue indicate that 71 percent of the benefit of the 529 plan extension would go to the 20 percent of taxpayers with incomes above $100,000 per year — those who can afford private school tuition already. Extending the 529 savings plan to cover K-12 private school tuition, in other words, is little more than a tax subsidy to parents already sending their children to private school, most of them with incomes well above the average. The current 529 plan for college tuition does operate as a savings incentive for some. But there is no requirement that a family actually put money aside for future college expenses. A family with a college tuition bill due Sept. 4 can put $3,239 in a 529 plan on Sept. 3, and take it all out again the next day to pay tuition. When they go to pay taxes the following April, they will be able to deduct that $3,239 from their income just as if they had put it in a savings account years ago. Still, it is likely that most families use the 529 Plan today to save for higher education, particularly as those costs can be $10,000 a year for a state university and more for a private college. The extension of the 529 tax benefit to K-12 tuition largely applies to people who already are enrolling their children in private school. Currently, there are about 32,600 K-12 students enrolled in private schools[ii] with parents of most of them paying tuition and also paying state income taxes. The extension of the 529 plan offers, in essence, a backdoor way for Iowa to subsidize this nonpublic education. There is little time to actually save for a child’s K-12 education, making it likely that this extension of tax benefits will simply be used to get an immediate taxpayer-financed subsidy to cover tuition bills of these 32,600 students. Iowa already provides some support for nonpublic education through the Tuition and Textbook Credit (TTC), and the proposed bill does not appear to prevent double dipping. For example, a couple paying $6,000 in private-school tuition for their 10-year-old could each put $3,000 in a 529 plan, then take it out a few days later to pay the tuition bill. Come tax time, they could deduct the $6,000 on line 24 of the Iowa 1040, reducing taxable income by $6,000. Then on line 44 they could take the maximum Tuition and Textbook Credit (TTC) of $1,000, for the same tuition payment. The Iowa Department of Revenue estimated that extending the 529 plan to K-12 education would cost the state $5.2 million in tax year 2019,[iii] while the State Treasurer’s Office put the estimate at $7.5 million. [iv] It would add to existing uses of the public’s tax subsidies for private education: the tuition and textbook credit, and the $12 million tax credit for contributions to private school tuition organizations. There are longstanding issues and concerns regarding the extent to which Iowa should provide any assistance to students enrolled in nonpublic education. This approach, however, adds administrative complexity and cost to the 529 program, reduces state revenue available for other needs, and adds to the subsidies of nonpublic education in a way that also disproportionately benefits high-income families. In terms of tax principles of fairness, simplicity, revenue adequacy, and public purpose, this extension of the 529 program fails on all counts. [i] A married couple with two children, for example, could contribute $12,956 per year (two contributors, times two children). In addition, grandparents or others could each contribute $3,239 per child, and would get the same Iowa tax benefit. [iii] Letter from the Iowa Department of Revenue, Research and Analysis Division, to the Legislative Services Agency, January 17, 2018. Real tax reform: What elements? We should all welcome a serious discussion of tax reform in the Iowa Legislature, with one huge caveat: It should focus on real issues, not made-up ones. There are real issues: Business tax credits continue to grow much faster than other state spending, and contribute significantly to the budget shortfalls that have become an annual problem. 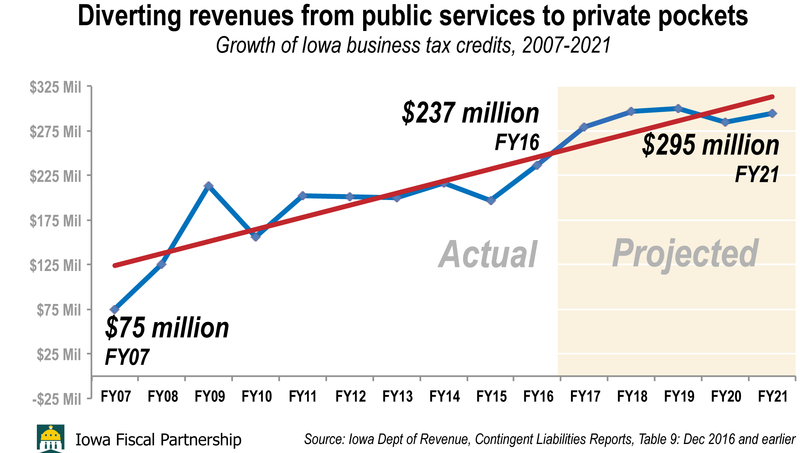 The effectiveness of many of these credits has been questioned by studies from the Iowa Department of Revenue, by academic research, and by the Iowa Tax Credit Review Panel of 2010. Reining in the credits going to businesses will not be easy. A bill was recently introduced (HSB187) to end the refundability of these credits — provisions that allow companies to receive a check from the state whenever the credit exceeds their total state income tax. The business lobby was out in full force to defend their perks. These income tax credits total over $285 million this year. More tax credits — $125 million for both this year and next — are part of the massive commercial property tax cuts of 2013. (In various ways, the 2013 cuts now cost the state treasury another $300 million annually.) Just a portion of these breaks would go a long way to solving the state’s perennial budget problem. The graph at right shows existing business income tax credits and new property tax credits together cost the state twice as much as the credits cost in 2013, leaving less to spend on critical public services. However, there is a real danger that any savings from capping or reducing business tax credits would not be directed at improving education, reducing student debt, cleaning our water, or restoring cuts to public safety and the courts. Instead, some legislators apparently would rather spend it on a made-up problem — that Iowa’s taxes are supposedly driving corporations and individuals out of the state. This is a faulty notion for three reasons. First, Iowa taxes are consistently found to be average among the 50 states, or below average. There have been several recent studies of Iowa’s business taxes by accounting firms. One found that Iowa state and local taxes falling on business are about average; three others found Iowa taxes to be below average (depending on the type of business) — including one report that ranked Iowa business taxes the fourth lowest in the country. State and local taxes overall represent about 5.9 percent of personal income in Iowa, just under the U.S. average of 6.0 percent. Second, taxes have little or nothing to do with people’s decisions to move from one state to another. ALEC (the American Legislative Exchange Council), AFP (the Koch-funded Americans for Prosperity), and other right-wing groups continue to push the notion that taxes drive migration patterns in an effort to validate their tax cutting approach to state economic policy. But this assertion is contradicted by research on the issue. Over their lifetimes, the majority of Americans do not move far, with most remaining in the state they grew up in or moving to a neighboring state. Those who move farther away do so for many reasons: job availability, climate, marriage, proximity to family, housing costs, the quality of schools, and other factors, according to years of research on this issue. This research consistently finds that taxes have a negligible effect on people’s decisions to move. Finally, decades of research have shown that state and local taxes on business are too small to have a significant effect on business investment and location decisions. All state and local taxes on businesses combined represent only about 1.8 percent of total business costs on average for all states. Businesses weigh most heavily the basics that comprise the other 98 percent of their cost structure: proximity to markets and to suppliers; transportation infrastructure; supply of labor with appropriate education and skills; wage and salary rates; energy costs; occupancy costs (to buy or lease space); access to supporting business services; the quality of local schools, recreation amenities, climate and other amenities important in attracting and retaining skilled labor; and proximity to university research facilities. Instead of relying on credible academic research, or the reports by accounting firms that show business taxes are below average in Iowa, proponents of business tax cuts cite Iowa’s supposedly low “business tax climate” ranking by the Tax Foundation. Yet this ranking has been thoroughly discredited. The drumbeat from the right has been the same for years — we need to lower Iowa’s taxes because they are making us uncompetitive; tax cuts will drive economic growth and prosperity. It is astounding that this argument is still being made after the fiasco in Kansas. Those same national groups pushing for regressive tax changes in Iowa (ALEC, AFP) convinced the Kansas governor and legislature in 2012 that individual and business tax cuts would act like a shot of adrenaline to the state economy. Instead, tax cuts have left Kansas mired in drastic budget shortfalls, credit downgrades, and school cutbacks. And the predicted economic miracle turned out to be a disaster: the state changed from above average to below average growth after the tax cuts went into effect. We should hope for real tax reform, the kind that eliminates wasteful spending on tax breaks that provide little or no economic benefit, and that ensures a stable revenue stream to fund education and other public services important to ordinary Iowans. We should resist the use of bogus “research” to justify further tax breaks for those who need it least. Peter Fisher is Research Director for the Iowa Policy Project. He holds a Ph.D. in economics from the University of Wisconsin-Madison and is professor emeritus of Urban and Regional Planning at the University of Iowa. A national expert on public finance, Fisher is frequently quoted in the Iowa and national media on issues involving tax policy and economic development strategies. Following publication of two published critiques of various state business climate rankings, Fisher has produced a website to track issues with such rankings and better perspective on state policies to promote growth, Grading the States, at www.gradingstates.org. The Department of Revenue’s evaluation studies can be found here. Reviews of academic research include those by this author on his website Grading the States, and by Wiliam Gale, Aaron Krupkin, and Kim Rueben. “The Relationship between Taxes and Growth at the State Level: New Evidence.” National Tax Journal, vol. 68, no. 4, December 2015, pp. 919-941. The Iowa Tax Credit Review Panel report can be found here. “A Spotlight, Not a Floodlight, on Business Breaks.” Iowa Policy Points blog. This includes $152 million estimated for FY 2017 for the Commercial and Industrial Property Tax Replacement; $125 million for the Business Property Tax Credit; and an additional $25 million in state School Foundation Aid necessitated by the reduced assessment of commercial and industrial property. See Summary of FY 2018 and FY2019 Budget and Governor’s Recommendations, LSA – Fiscal Services, January 12, 2017, p. 218; Summary of FY 2017 Budget and Governor’s Recommendations, LSA – Fiscal Services, January 14, 2016, p. 63. Ernst and Young, LLP and the Council on State Taxation, Total State and Local Business Taxes: State-By-State Estimates for Fiscal Year 2015, December 2016 . Anderson Economic Group, 2016 State Business Tax Burden Rankings, 7th Edition, May 2016. KPMG and the Tax Foundation, Location Matters: The State Tax Costs of Doing Business, 2015. Ernst and Young, LLP and the Council on State Taxation, Competitiveness of State and Local Business Taxes on New Investment, April 2011. Today’s Virtual House Graphic: Risky Fix to Non-Problem. Iowa Policy Points blog. See Taxes Have Little to do with People’s Decisions to Move to or From a State. On this author’s website, Grading the States. See State and Local Business Taxes are Not Significant Determinants of Growth. On this author’s website, Grading the States. See The Tax Foundation’s State Business Tax Climate Index. On this author’s website, Grading the States. See numerous blog posts from the Kansas Center for Economic Growth. See The Lessons of Kansas. On this author’s website, Grading the States. IOWA CITY, Iowa (Feb. 15, 2017) — Iowa’s lucrative research subsidy provided as much in 2016 to very large companies that do not pay Iowa state income tax as legislators recently approved as an increase in state school aid. The Department of Revenue’s annual report on the Research Activities Credit (RAC), released Wednesday, showed that in 2016 the corporate share of the subsidy cost Iowa taxpayers a total of $49.1 million — with 82 percent, or $40.4 million, in 207 checks to companies that paid no state income tax. Most of those so-called “refunds” — not of taxes paid but of tax credits not needed to erase tax liability — went to very large companies that had over $500,000 in research credit claims. Of every $10 in RAC checks, $9 went to those large companies. “Put another way, less than 6 percent of the corporate claimants for this credit took 90 percent of the benefit,” said Mike Owen, executive director of the nonpartisan Iowa Policy Project. “It is really time to examine whether this is a wise use of what legislators tell us are scarce resources. Companies made 305 claims totaling $49.1 million for the RAC and the related supplemental RAC for which some claimants are eligible, down $1 million from the previous year. Of those claims, 207 (68 percent) were paid in whole or in part as checks to companies that paid no state corporate income tax. Eighty-two percent of the value of those tax credits were paid as checks to companies. Very large claimants — companies with over $500,000 in RAC claims — had at least 88 percent of those corporate checks ($35.6 million) while paying no income tax. The large claimants accounted for 90 percent of the corporate claims. “This report illustrates a budget choice,” Owen said. “Legislators this month approved about $40 million in additional state aid to local schools for next budget year. This report suggests they could have doubled that if they were willing to cut back this tax break to simply excusing taxes owed. Overall, the credit program cost $58.4 million in calendar year 2016, with $49.1 million of that in claims by corporations and the rest by individuals. The credit is refundable, which means that if a company has more tax credits available than it owes in taxes, the state makes a payment for the difference. The report is available on the Department of Revenue website at https://tax.iowa.gov/sites/files/idr/RAC Annual Report 2016.pdf. The Iowa Fiscal Partnership (IFP), a joint initiative of the Iowa Policy Project and another nonpartisan organization, the Child & Family Policy Center in Des Moines, has reported on the RAC for many years. Owen noted that Iowans have access to more information about this credit than they did years ago because of the annual report, which was ordered by the Legislature in 2009. All of the state annual reports on the RAC are available on the Iowa Department of Revenue website at https://tax.iowa.gov/report/Reports?combine=Research%20Activities. Those reports show that the number of corporate claimants has grown from 160 in 2010, the first full year covered by the annual reports, to 248 in both 2014 and 2015. The number of claimants receiving the credit as checks, rather than to only erase tax liability, rose from 133 in 2010 to 181 in 2014 and 186 in 2015. A special tax credit review panel recommended in 2010 that the state curtail some spending on business tax credits. Among its proposals were to scale back “refunds” of the research credit, and to impose a five-year sunset on all tax credits to assure that the Legislature would have to vote to continue them. For more information about the Research Activities Credit and other Iowa tax credit issues, see the Iowa Fiscal Partnership website at www.iowafiscal.org. Against a backdrop of calls for new tax cuts, Governor Branstad in his silence sounded a note of caution. In fact, the Governor’s apparently final Condition of the State message was notable for several issues that he chose not to address or promote. Iowans who are vulnerable economically are looking for answers, yet there was no discussion of an increase in the minimum wage, now stagnant for nine years at $7.25, or of protecting local minimums above it. The Governor offered no guidance for the Legislature and the public for what could happen with health coverage if Congress repeals the Affordable Care Act or imposes new restrictions on Medicaid. These issues could quickly become the most pressing in our state as the Governor prepares to leave office for his ambassadorship to China. At the same time he encouraged Iowans “to ask the tough questions that challenge the status quo” about services and state commissions, he declined to make the same charge regarding Iowa spending on tax breaks — even though General Fund tax credits have more than doubled in just 10 years, with reforms long past due. At the same time he set a goal for 70 percent of the workforce to have post-high school education or training by 2025, he was promoting $34 million in cuts in higher education from the current year budget. At the same time he promoted a House-passed plan to divert General Fund revenues to fund water-quality efforts, he again rejected a long-term, dedicated and growing source of revenue — a three-eighths-cent sales tax as authorized by voters in 2010 — that would not compete with existing needs. There will be much for Iowans to review in the budget proposals as they make their way through the legislative process, along with issues including public-sector collective bargaining and other big issues affecting working families in the coming weeks and months. It is reassuring that the Governor chose not to grab the tax-cut mantle so strongly on his way out the door. But he is missing an opportunity to rein in or even reverse Iowa’s runaway spending on tax credits, which has contributed to unmet needs in our state. It was​ fascinating Tuesday to see Iowa lawmakers talking about zero-based budgeting — starting every budget from scratch — when they have refused to do the same with tax credits. Spending on tax credits — including millions to companies that don’t pay any state income tax — just keeps going on and on. Companies basically get to appropriate state money to themselves. Quite a deal if you can get it. If the state were to sunset business tax credits, as recommended in 2010 by a special governor-appointed Tax Credit Review Panel, lawmakers could review each one and decide which are actually producing a public benefit, whether any of them are money well spent. If so, they could renew the credit. If not, we could put our resources where they make more sense for all Iowans. Maybe a part-time legislature could start with a zero base on tax credits before we talk about it for an entire state budget.